• Give Australian prawns a special place in the eating habits of Australians. In a transparent, industry-driven selection process, Brand Council were appointed to develop the strategy and the aligned implementation plan. The market strategy to ‘Love Australian Prawns’ and its accompanying logo was launched in October/November 2012 at 16 industry meetings across Australia. A subsequent marketing forum in Sydney in March 2013 prioritised the promotional activities which had been developed by Brand Council, with a decision for an initial focus on independent fishmongers. 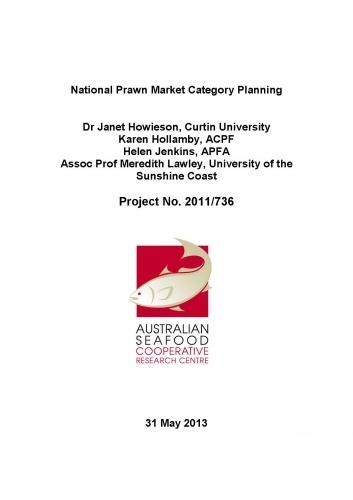 Industry participants agreed that funding to support the implementation should be collected by a voluntary contribution from prawn producers across Australia with an agreed minimum funding amount of $500,000. To raise this, it was calculated that both sectors would need to contribute 0.22% of their Gross Value of Production (GVP) on beach prices. A supplementary agreement to manage the funding and implementation process was signed between the Fisheries Research and Development Corporation (FRDC), Seafood Co-operative Research Centre (CRC), the Australian Prawn Farmers Association and the Australian Council of Prawn Fisheries, and a management committee was formed to oversee activities. The national launch commenced in September 2014.